A protocol for in vitro induction of endothelial-mesenchymal transition (EndMT), which is useful for investigating cellular signaling pathways involved in EndMT, is described. In this experimental model, EndMT is induced by treatment with TGF-β in MS-1 endothelial cells. Suzuki, H. I., Horie, M., Mihira, H., Saito, A. Molecular Analysis of Endothelial-mesenchymal Transition Induced by Transforming Growth Factor-β Signaling. J. Vis. Exp. (138), e57577, doi:10.3791/57577 (2018). Phenotypic plasticity of endothelial cells underlies cardiovascular system development, cardiovascular diseases, and various conditions associated with organ fibrosis. In these conditions, differentiated endothelial cells acquire mesenchymal-like phenotypes. This process is called endothelial-mesenchymal transition (EndMT) and is characterized by downregulation of endothelial markers, upregulation of mesenchymal markers, and morphological changes. EndMT is induced by several signaling pathways, including transforming growth factor (TGF)-β, Wnt, and Notch, and regulated by molecular mechanisms similar to those of epithelial-mesenchymal transition (EMT) important for gastrulation, tissue fibrosis, and cancer metastasis. Understanding the mechanisms of EndMT is important to develop diagnostic and therapeutic approaches targeting EndMT. Robust induction of EndMT in vitro is useful to characterize common gene expression signatures, identify druggable molecular mechanisms, and screen for modulators of EndMT. Here, we describe an in vitro method for induction of EndMT. MS-1 mouse pancreatic microvascular endothelial cells undergo EndMT after prolonged exposure to TGF-β and show upregulation of mesenchymal markers and morphological changes as well as induction of multiple inflammatory chemokines and cytokines. Methods for the analysis of microRNA (miRNA) modulation are also included. These methods provide a platform to investigate mechanisms underlying EndMT and the contribution of miRNAs to EndMT. Endothelial-mesenchymal transition (EndMT) is the process by which a differentiated endothelial cell undergoes a variety of molecular changes, resulting in a fibroblast-like mesenchymal cell1. EndMT was initially described as an endothelial cell transformation during development of the heart2,3. In early heart development, the heart tube consists of an inner endocardium and an outer myocardium. These two layers are separated by a layer of extracellular matrix called the cardiac jelly. The embryonic endocardial cells, which acquire endothelial cell markers, transit into mesenchymal cells, invade the underlying cardiac jelly, and promote formation of the cardiac cushions, providing the foundation for the atrioventricular valves and septum and the semilunar valves. Furthermore, EndMT has been suggested to be sources of pericytes and vascular smooth muscle cells in other embryonic vascular systems including coronary vessels, abdominal aorta, and pulmonary artery4,5,6. In addition, EndMT is implicated in physiological angiogenic sprouting7. Accumulating evidence has suggested that EndMT is also involved in multiple cardiovascular diseases and other diseases1,8. EndMT-associated conditions include vascular calcification, atherosclerosis, pulmonary arterial hypertension, cavernous malformation, organ fibrosis, vein graft remodeling, allograft dysfunction in kidney transplantation, and cancer8,9,10,11,12,13,14,15,16,17,18. A recent report described that several molecular EndMT markers can be a tool for diagnosis and prognosis prediction of renal graft dysfunction in kidney transplantation17. Modulation of EndMT-related cellular signaling pathways have been shown to ameliorate several disease conditions including cardiac fibrosis and vein graft remodeling in animal models8,15. Therefore, understanding the mechanisms underlying EndMT is important to develop diagnostic and therapeutic strategies targeting EndMT. EndMT is characterized by loss of cell-cell junctions, increase in migratory potential, downregulation of endothelial-specific genes such as VE-cadherin, and upregulation of mesenchymal genes including α-smooth muscle actin (α-SMA). In addition, EndMT and epithelial-mesenchymal transition (EMT), a similar process that converts epithelial cells to mesenchymal cells, are associated with altered production of various extracellular matrix components, which may contribute to the development of tissue fibrosis8,19. Recently, several in vitro studies of EndMT have elucidated details of molecular mechanisms of EndMT15,20. EndMT is induced by various signaling pathways including transforming growth factor (TGF)-β, Wnt, and Notch1. Among them, TGF-β plays pivotal roles in the induction of both EMT and EndMT. In EndMT, prolonged exposure to TGF-β results in EndMT in various endothelial cells, while short exposure appears to be insufficient21. We here described a straightforward protocol for EndMT induction, in which MILE SVEN 1 (MS-1) mouse pancreatic microvascular endothelial cells undergo EndMT in vitro after prolonged exposure to TGF-β20. In this model, multiple downstream analyses can be performed to investigate hallmark features of EndMT, including morphological changes, downregulation of endothelial markers, upregulation of mesenchymal markers and inflammatory genes, cytoskeletal rearrangements, and collagen gel contraction. MicroRNAs (miRNAs) are ~22 nt small regulatory RNAs that direct posttranscriptional repression of various mRNA targets22,23. Through seed sequence-mediated target recognition, miRNAs suppress hundreds of target genes and modulate diverse cellular functions such as cell differentiation, proliferation, and motility. This is also the case for regulation of EMT and EndMT, and several miRNAs have been reported as regulators of EMT and EndMT24,25. The EndMT model presented in this review can be easily combined with miRNA modulation procedures to test the roles of miRNAs in EndMT. The present review summarizes our experimental procedures to investigate TGF-β-induced EndMT in MS-1 cells and also includes comparison of conditions of EndMT induction by TGF-β in other endothelial cells. Maintain MS-1 cells in standard culture conditions and avoid confluency. A source of MS-1 cells is described in the Table of Materials. For MS-1 cells, use Minimum Essential Medium-α (MEM-α) with 10% fetal calf serum (FCS), 50 U/mL penicillin, and 50 μg/mL streptomycin. Wash MS-1 cells on 10 cm dish with 1x phosphate buffered saline (PBS) and add 1.0 mL of trypsin to the plate. Incubate for 5 min at 37 °C. Detach the cells using 9 mL of culture media. Collect cell suspension in a 15 mL tube. Centrifuge the cell suspension at 300–400 x g for 5 min at room temperature. Carefully remove the supernatant and suspend the cell pellet in pre-warmed culture media. Count viable cells using Trypan Blue solution and a standard hemocytometer or an automatic cell counter. Plate MS-1 cells onto uncoated standard culture plates at 0.5 x 103 cells per cm2 for long term culture. For example, plate 5.0 x 103 cells per well in a 6 well culture plate. Use the same culture media including the same concentration of FCS. In MS-1 cells, TGF-β induces EndMT in long term culture (at least 48–72 h) with the use of FCS. Stimulate endothelial cells with TGF-β2 (a final concentration of 1 ng/mL) after 24 h.
Culture cells in a humidified incubator (5% CO2, 37 °C). Monitor cells daily when focusing on morphological changes. Replace the media with fresh pre-warmed culture media containing TGF-β2 after 48 h of treatment with TGF-β in long term culture. Proceed to the downstream analyses. Typically, actin reorganization is observed after 24 h of treatment, and downregulation of endothelial markers and upregulation of mesenchymal markers are observed after 48–72 h of treatment with TGF-β. Maintain MS-1 cells in standard culture conditions. Plate MS-1 cells onto 4 well cell culture chamber slides at 1.0 x 103 cells per well (1.7 cm2). Slides are pre-coated with gelatin. Use 0.5–1.0 mL of culture media per well. Stimulate endothelial cells with TGF-β2 (a final concentration of 1 ng/mL) after 24 h. When analyzing the involvement of ROCK in EndMT, add a ROCK inhibitor Y-27632 (10 μM) 1 h prior to TGF-β treatment. When assessing the effect of TGF-β signaling inhibition, TGF-β receptor kinase inhibitors can be used. Culture cells in a humidified incubator (5% CO2, 37 °C). Actin reorganization is observed in MS-1 cells after 24 h of treatment with TGF-β. Other changes become obvious after 48–72 h of treatment. For 72 h culture, replace the media with fresh media containing TGF-β after 48 h of treatment with TGF-β. After 24 h of TGF-β treatment, remove media, fix cells with 4% paraformaldehyde in 1x PBS for 20 min at room temperature, and rinse cells with 1x PBS. Incubate with 0.2% Triton X-100 for 5 min at room temperature. Rinse cells three times with 1x PBS. Incubate with phalloidin-tetramethylrhodamine B isothiocyanate from Amanita phalloides diluted 150-fold with blocking buffer for 1 h at room temperature. Stain the nuclei with cyanine nucleic acid binding dyes for 5 min at room temperature. Rinse slides and mount coverslips face down on a slide using slide mounting media. Observe with a confocal microscope. Use a 543 nm laser and an emission filter of 560–615 nm for detection of fluorescence of phalloidin. Use a 633 nm laser and an emission filter longer than 650 nm for nuclear staining. Upon treatment with TGF-β, formation of thick stress fibers would be observed. After 72 h of TGF-β treatment, remove media, fix cells with cold 50% methanol and 50% acetone (0.5–1.0 mL per well) for 5 min. Rinse cells three times with 1x PBS (0.5–1.0 mL per well). Incubate with primary antibodies in blocking buffer overnight at 4 °C in the dark according to the manufacturer's recommended concentration. Use VE-cadherin monoclonal antibody (BV13, 1:100 dilution) and Cy3-conjugated α-SMA monoclonal antibody (1A4, 1:200 dilution)20. Incubate cells with a green dye-conjugated secondary antibody to VE-cadherin antibody in blocking buffer for 1 h at room temperature in the dark according to the manufacturer's recommended concentration. Observe with a confocal microscope. Use a 543 nm laser and an emission filter of 560–615 nm for detection of α-SMA (Cy3). Use a 488 nm laser and an emission filter of 505–550 nm for detection of VE-cadherin. Typically, upon treatment with TGF-β treatment, decrease in VE-cadherin signals and increase in α-SMA signals would be observed. Perform culture of MS-1 cells with/without TGF-β for 72 h prior to collagen gel contraction assay. Prepare the type I collagen gel on ice. Mix cold collagen solution, 10x concentrated MEM medium, and collagen dilution buffer containing 0.05 N NaOH, 2.2% NaHCO3, and 200 mM HEPES pH 7.4 at an 8:1:1 ratio. Mix 200 mL of control or TGF-β-treated endothelial cell suspensions (1.0 x 106 cells/200 μL) and 800 μl of the collagen gel solution. For TGF-β treated samples, add TGF-β2 (1 ng/mL) to the cell suspension. Add 1.0 mL of the mixture to each well of 12-well culture plates and allow to solidify in the incubator at 37 °C for 30–60 min. After gelatinization, overlay 1.0 mL of MEM-α containing 10% FCS, 50 U/mL penicillin, and 50 μg/mL streptomycin to float the gel. For TGF-β treated samples, add TGF-β2 (1 ng/mL) to the media. NOTE: For TGF-β treated samples, add TGF-β to both the gel and culture media. Incubate the floating gels at 37 °C for 48 h.
Scan the images of gels from the bottom of plates using a scanner. Alternatively, record the images of gels using a digital camera at a fixed distance above the gels. Quantify the gel surface area based on pixel number using ImageJ. Select the gel using a freehand selection or related selection tools, or select the gel using "Image | Adjust | Color Threshold" tool, and then determine the area of gel using "Analyze | Measure" command. Transfect Locked Nucleic Acid (LNA) miRNA inhibitors, synthetic miRNA duplexes or siRNAs (20 or 50 nM) using lipofection reagents according to the manufacturer's instruction. Details and sources of LNA miRNA inhibitors, synthetic miRNA duplexes, and siRNAs were described in our previous reports26,27. In MS-1 cells, standard transfection procedures based on the manufacturer's instruction work well for introduction of LNA miRNA inhibitors, synthetic miRNA duplexes or siRNAs. After 16–48 h, stimulate endothelial cells with TGF-β2 (a final concentration of 1 ng/mL). Proceed to various downstream analyses including RNA expression analysis (quantitative RT-PCR and RNA-sequencing (RNA-seq) analyses), immunocytochemical analysis, and reporter assay. Downstream analyses have been described in our previous reports20,26,27. TGF-β is a potent inducer of EndMT in various endothelial cells. After 24 h treatment with TGF-β in MS-1 cells, staining for F-actin shows reorganization of actin stress fibers (Figure 1A)20. Pretreatment with a ROCK inhibitor Y-27632 inhibits the induction of actin reorganization20. MS-1 endothelial cells change from a classical cobblestone-like morphology to a mesenchymal spindle-shaped morphology upon TGF-β treatment (Figure 1B). TGF-β-treated cells lose cell-cell contact. 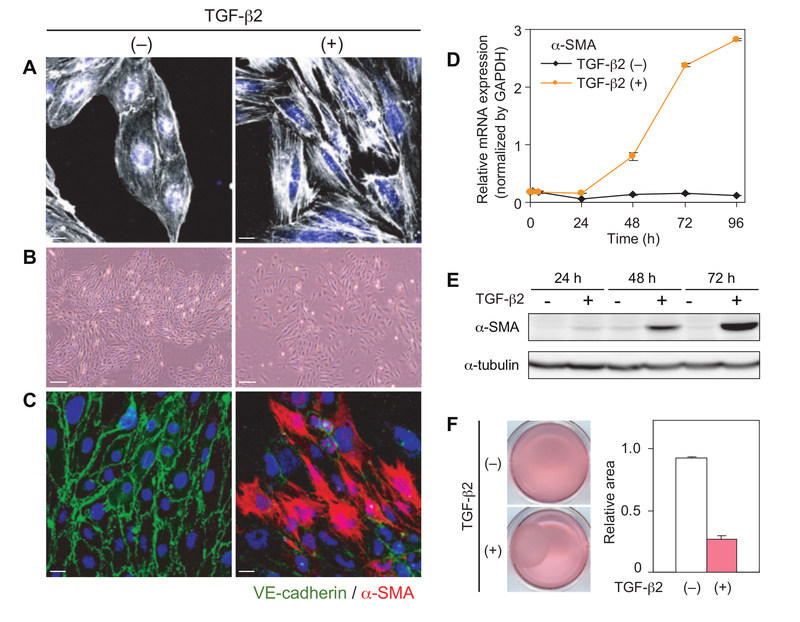 After treatment with TGF-β for 48–72 h, immunocytochemical analyses demonstrate decreased expression of VE-cadherin and increased expression of α-SMA (Figure 1C). 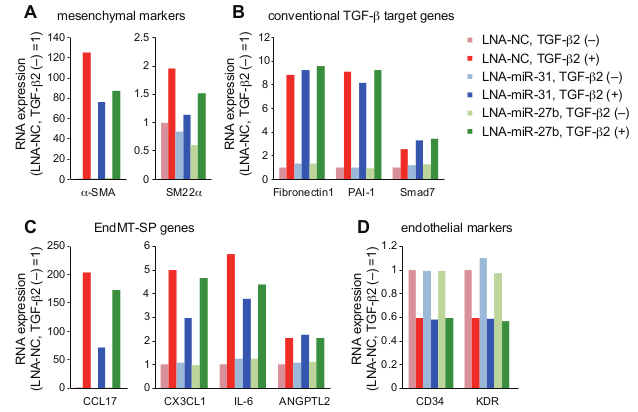 TGF-β drastically induces the expression of α-SMA at both mRNA and protein levels in MS-1 cells after 48–72 h of treatment (Figures 1D and 1E). Mammalian TGF-β includes TGF-β1, 2, and 3 isoforms. A previous study using mouse cultured endocardial cushion explants has shown that TGF-β2 but not TGF-β3 is obligatory for transformation of endocardial cushion cells28. On the other hand, we previously compared the effects of three isoforms on α-SMA expression and confirmed that all isoforms similarly induced α-SMA expression in MS-1 cells20. Collagen gel contraction assay shows enhanced contraction of the collagen type I gel by MS-1 cells following TGF-β treatment (Figure 1F). This effect suggests the acquisition of mesenchymal cell capacity to remodel extracellular matrix. These features are hallmark traits of EndMT20. In our previous report20, treatment with a ROCK inhibitor Y-27632 strongly suppressed induction of mesenchymal markers α-SMA and SM22α without concomitant suppression of induction of other TGF-β target genes such as Fibronectin 1 and MMP-2. EndMT is a highly dynamic process. In MS-1 cells, the effects of TGF-β on α-SMA expression and morphology are reversible; after TGF-β deprivation, α-SMA expression decreases to basal levels (Figure 2A), and cells recover a cobblestone-like morphology (Figure 2B). In addition, induction of EndMT and EMT is associated with dynamic changes in secretory capacity of multiple chemokines and cytokines. Multiple inflammatory chemokines and cytokines including CCL17, CX3CL1, CXCL16, IL-6, and Angptl2 are induced by TGF-β in MS-1 cells, which we previously designated EndMT-associated secretory phenotype (EndMT-SP)26. This experimental model is useful to investigate the putative regulators of EndMT and EndMT-SP. We have previously studied the roles of several miRNAs in EndMT by enhancing or inhibiting miRNA activities26,27. In MS-1 cells, miRNA activities can be robustly modulated by miRNA mimic oligonucleotides or LNA-based miRNA inhibitors, and multiple downstream assays including RNA-seq analysis can be easily performed (Figure 3). Based on integrative transcriptome analysis, we have previously linked constitutively active miR-31 to EndMT regulation in MS-1 cells26. RNA-seq analysis showed that inhibition of miR-31 by LNA miRNA inhibitor results in attenuation of induction of mesenchymal markers (Figure 3A) and EndMT-SP genes (Figure 3C), while it does not affect induction of conventional TGF-β target genes such as Fibronectin 1, PAI-1, and Smad7 (Figure 3B) and downregulation of endothelial markers (Figure 3D)26. Both TGF-β and miR-31 downregulate Stk40, a negative regulator of NF-κB pathway, which acts as a potential regulator of EndMT-SP. Although TGF-β does not increase the expression of miR-31, TGF-β induces alternative polyadenylation-mediated exclusion of internal poly(A) sequence in Stk40 3'UTR, thereby enhancing targeting of Stk40 by constitutive active miR-31 and finally suppressing Stk4026. In addition, we previously examined the roles of TGF-β-inducible miR-27b in EndMT27. Inhibition of miR-27 suppressed upregulation of mesenchymal markers (Figure 3A) while the effects on conventional TGF-β target genes, EndMT-SP genes, and endothelial markers were marginal (Figures 3B, 3C, and 3D)27. Figure 1: Induction of EndMT in MS-1 cells by TGF-β. (A) Actin reorganization in MS-1 cells after 24 h of TGF-β2 treatment (1 ng/mL). (B) Morphological changes in MS-1 cells after 72 h of TGF-β2 treatment (1 ng/mL). (C) Immunocytochemical analyses for VE-cadherin and α-SMA in MS-1 cells after 72 h of TGF-β2 treatment (1 ng/mL). (D, E) Expression changes in α-SMA, determined by standard quantitative RT-PCR analysis (D) and Western blot analysis (E). (F) Collagen gel contraction assay. The ratio of the surface area after 72 h culture with/without TGF-β2 treatment (1 ng/mL) to the original surface are displayed. Scale bars = 20 μm (A and C), and 200 μm (B). Figures are modified from Mihira et al.20. Error bars represent standard deviations. Please click here to view a larger version of this figure. Figure 2: Reversible effects of TGF-β in MS-1 cells. (A) α-SMA mRNA expression and (B) cell morphology after withdrawal of TGF-β2 in MS-1 cells. Scale bars = 200 μm. Error bars represent standard deviations. Please click here to view a larger version of this figure. Figure 3: RNA-seq analysis in MS-1 cells. After introduction of LNA miRNA inhibitors and treatment with TGF-β2 (72 h), RNA-seq analysis was performed26,27. NC: negative control. Expression changes of representative genes are shown (A, mesenchymal markers; B, conventional TGF-β target genes; C, EndMT-SP genes; and D, endothelial markers). FPKM (fragments per kilobase of transcript per million mapped reads) values were normalized with the values of a control sample (LNA-NC without TGF-β2 treatment). Error bars represent standard deviations. human umbilical vein endothelial cells (HUVEC) Induction by mesenchymal differentiation medium (TGF-β 5 ng/mL, PDGF-BB 25 ng/mL), 5–21 days. Krenning et al. human cutaneous microvascular endothelial cells (HCMEC) Induction by TGF-β2 (10 ng/mL), without FBS, 2 days. Medici et al. human coronary endothelial cells (HCEC) Induction by TGF-β1 (10 ng/mL), 6 days. Inhibition by BMP-7. Zeisberg et al. mouse lung endothelial cells (MLEC) Induction by TGF-β1 (10 ng/mL), reduce to 2% FBS, without endothelial mitogen, 2 days. Zeisberg et al. rat brain endothelial cells (BEC) Induction by TGF-β1 (10 ng/mL), 2 days. Krizbai et al. bovine aortic endothelial cells (BAEC) Induction by TGF-β1 (1 ng/mL), 5 days. Arciniegas et al. immortalized bovine retinal microvascular endothelial cells (iBREC) Induction by TGF-β2 (10 ng/mL), 3–6 days. Deissler et al. ovine aortic valve endothelial cells Induction by TGF-β1 or 3 (1 ng/mL), 6 days. Paranya et al. MS-1 mouse pancreatic microvascular endothelial cells Induction by TGF-β (10 ng/mL), activated Ras expression, 1 day. Hashimoto et al. MS-1 mouse pancreatic microvascular endothelial cells Induction by TGF-β2 (1 ng/mL), 2–3 days. Mihira et al. Table 1: Induction of EndMT by TGF-β in various endothelial cells. Culture conditions of EndMT induction by TGF-β are summarized. Changes in culture conditions including serum concentration and addition or removal of other growth factors are also noted. It has been reported that activated Ras and TGF-β treatment for 24 h induced EndMT in MS-1 cells, while TGF-β alone failed to induce EndMT in this short period21. Consistently, we observed that TGF-β substantially induced EndMT after longer treatment (48–72 h) in MS-1 cells20. EndMT has been repeatedly observed after prolonged treatment with TGF-β (2–6 days) in various endothelial cells such as human umbilical vein endothelial cells (HUVEC), human cutaneous microvascular endothelial cells (HCMEC), human coronary endothelial cells (HCEC), mouse lung endothelial cells (MLEC), rat brain endothelial cells (BEC), bovine aortic endothelial cells (BAEC), immortalized bovine retinal microvascular endothelial cells (iBREC), and ovine aortic valve endothelial cells8,18,29,30,31,32,33,34. In Table 1, we summarized the conditions of mesenchymal marker induction by TGF-β in various endothelial cells8,18,20,21,29,30,31,32,33,34. Comparison of these reports suggests that each endothelial cell line has different thresholds for EndMT. Differential sensitivity to TGF-β or other mechanisms may underlie diverse EndMT-related pathological conditions in different organs. This should be considered together with the results of in vivo studies. The details of in vitro EndMT induction protocol need to be tailored in different cell lines: e.g., concentration of TGF-β, concentration of serum, addition or removal of other growth factors, and culture period. For example, HUVECs often poorly respond to TGF-β and EndMT would be induced by combination with other factors such as PDGF-BB and inflammatory stimuli and/or modulation of serum concentration and other medium components in a longer culture setting29,35. In addition, overconfluency would mitigate the responses to TGF-β. EndMT is a dynamic process and an opposite process called mesenchymal-endothelial transition (MEndoT) has been recently reported36. While induction of mesenchymal markers by TGF-β alone is reversible in MS-1 cells (Figure 2), it has been reported that downregulation of endothelial markers in MS-1 cells with activated Ras persisted after withdrawal of TGF-β21. Irreversible EndMT has been also reported in iBREC and ovine aortic valve endothelial cells33,34. In addition, a previous report showed that the EndMT process persisted after withdrawal of TGF-β due to a sustained activation of Ras-GTP and methylation of the RASAL1 promoter in human coronary endothelial cells37. Thus, comparison of these models may be also useful to understand the regulatory mechanisms of endothelial cell plasticity. Responsiveness of endothelial cells to EndMT induction appears to be substantially heterogeneous38. Xiao et al. reported that tumor-specific endothelial cells from a mammary tumor model show distinct forms of EndMT in response to TGF-β stimulation38. TGF-β-driven EndMT is also modulated by other signaling pathways including FGF-2, BMP-7, and IL-1β35,37,38. We also found that TNF-α enhances TGF-β-induced EndMT and EndMT-SP in MS-1 cells26. Furthermore, it is well known that EndMT is induced by other signaling pathways including Wnt, Notch, and hypoxia1. Thus, combination with other stimuli in various endothelial cells may be important to understand heterogeneity of EndMT responsiveness. The EndMT protocol presented here can be easily modified to investigate the regulators of EndMT. In fact, we have characterized various regulators of EndMT in MS-1 cells20,26,27. A guanine nucleotide exchange factor Arhgef5 and myocardin-related transcription factor-A (MRTF-A) are induced by Smad signals, and both contribute to α-SMA upregulation in MS-1 cells20. Thus, TGF-β signaling activates both Rho signals and MRTF-A to induce EndMT. In addition, we also found that constitutively active miR-31 and TGF-β-inducible miR-27b positively regulate EndMT induction26,27. In MS-1 cells, constitutively active miR-31 is also necessary for TGF-β-induced EndMT-SP26. Overall, these in vitro EndMT induction procedures would be useful for understanding the biology of EndMT, identifying EndMT-associated gene signatures, and developing strategies to modulate this process. We thank Zea Borok and Kohei Miyazono for suggestions in preparation of manuscript. H.I.S. and M.H. are supported by the Uehara Memorial Foundation Research Fellowship, and H.I.S. is supported by the Osamu Hayaishi Memorial Scholarship for Study Abroad. This work was supported by a grant from Takeda Science Foundation (A.S.). Sanchez-Duffhues, G., Garcia de Vinuesa, A., Ten Dijke, P. Endothelial-to-mesenchymal transition in cardiovascular diseases: Developmental signaling pathways gone awry. Developmental Dynamics. (2017). Markwald, R. R., Fitzharris, T. P., Smith, W. N. Structural analysis of endocardial cytodifferentiation. Developmental Biology. 42, (1), 160-180 (1975). Eisenberg, L. M., Markwald, R. R. Molecular regulation of atrioventricular valvuloseptal morphogenesis. Circulation Research. 77, (1), 1-6 (1995). Chen, Q., et al. Endothelial cells are progenitors of cardiac pericytes and vascular smooth muscle cells. Nature Communications. 7, 12422 (2016). DeRuiter, M. C., et al. Embryonic endothelial cells transdifferentiate into mesenchymal cells expressing smooth muscle actins in vivo and in vitro. Circulation Research. 80, (4), 444-451 (1997). Arciniegas, E., Neves, C. Y., Carrillo, L. M., Zambrano, E. A., Ramirez, R. Endothelial-mesenchymal transition occurs during embryonic pulmonary artery development. Endothelium. 12, (4), 193-200 (2005). Welch-Reardon, K. M., Wu, N., Hughes, C. C. A role for partial endothelial-mesenchymal transitions in angiogenesis. Arteriosclerosis, Thrombosis, and Vascular Biology. 35, (2), 303-308 (2015). Zeisberg, E. M., et al. Endothelial-to-mesenchymal transition contributes to cardiac fibrosis. Nature Medicine. 13, (8), 952-961 (2007). Chen, P. Y., et al. Endothelial-to-mesenchymal transition drives atherosclerosis progression. Journal of Clinical Investigation. 125, (12), 4514-4528 (2015). Bostrom, K. I., Yao, J., Guihard, P. J., Blazquez-Medela, A. M., Yao, Y. Endothelial-mesenchymal transition in atherosclerotic lesion calcification. Atherosclerosis. 124-127 (2016). Qiao, L., et al. Endothelial fate mapping in mice with pulmonary hypertension. Circulation. 129, (6), 692-703 (2014). Ranchoux, B., et al. Endothelial-to-mesenchymal transition in pulmonary hypertension. Circulation. 131, (11), 1006-1018 (2015). Maddaluno, L., et al. EndMT contributes to the onset and progression of cerebral cavernous malformations. Nature. 498, (7455), 492-496 (2013). Krenning, G., Zeisberg, E. M., Kalluri, R. The origin of fibroblasts and mechanism of cardiac fibrosis. Journal of Cell Physiology. 225, (3), 631-637 (2010). Cooley, B. C., et al. TGF-beta signaling mediates endothelial-to-mesenchymal transition (EndMT) during vein graft remodeling. Science Translational Medicine. 6, (227), 227ra234 (2014). Wang, Z., et al. Transforming Growth Factor-beta1 Induces Endothelial-to-Mesenchymal Transition via Akt Signaling Pathway in Renal Transplant Recipients with Chronic Allograft Dysfunction. Annals of Transplantation. 21, 775-783 (2016). Xu-Dubois, Y. C., et al. Markers of Endothelial-to-Mesenchymal Transition: Evidence for Antibody-Endothelium Interaction during Antibody-Mediated Rejection in Kidney Recipients. Journal of the American Society of Nephrology. 27, (1), 324-332 (2016). Zeisberg, E. M., Potenta, S., Xie, L., Zeisberg, M., Kalluri, R. Discovery of endothelial to mesenchymal transition as a source for carcinoma-associated fibroblasts. Cancer Research. 67, (21), 10123-10128 (2007). Pardali, E., Sanchez-Duffhues, G., Gomez-Puerto, M. C., Ten Dijke, P. TGF-beta-Induced Endothelial-Mesenchymal Transition in Fibrotic Diseases. International Journal of Molecular Sciences. 18, (10), (2017). Mihira, H., et al. TGF-beta-induced mesenchymal transition of MS-1 endothelial cells requires Smad-dependent cooperative activation of Rho signals and MRTF-A. Journal of Biochemistry. 151, (2), 145-156 (2012). Hashimoto, N., et al. Endothelial-mesenchymal transition in bleomycin-induced pulmonary fibrosis. American Journal of Respiratory Cell and Molecular Biology. 43, (2), 161-172 (2010). Suzuki, H. I., Miyazono, K. Dynamics of microRNA biogenesis: crosstalk between p53 network and microRNA processing pathway. Journal of Molecular Medicine (Berl). 88, (11), 1085-1094 (2010). Suzuki, H. I., Miyazono, K. Emerging complexity of microRNA generation cascades. Journal of Biochemistry. 149, (1), 15-25 (2011). Nicoloso, M. S., Spizzo, R., Shimizu, M., Rossi, S., Calin, G. A. MicroRNAs--the micro steering wheel of tumour metastases. Nature Reviews Cancer. 9, (4), 293-302 (2009). Lagendijk, A. K., Goumans, M. J., Burkhard, S. B., Bakkers, J. MicroRNA-23 restricts cardiac valve formation by inhibiting Has2 and extracellular hyaluronic acid production. Circulation Research. 109, (6), 649-657 (2011). Katsura, A., et al. MicroRNA-31 is a positive modulator of endothelial-mesenchymal transition and associated secretory phenotype induced by TGF-beta. Genes Cells. 21, (1), 99-116 (2016). Suzuki, H. I., et al. Regulation of TGF-beta-mediated endothelial-mesenchymal transition by microRNA-27. Journal of Biochemistry. 161, (5), 417-420 (2017). Camenisch, T. D., et al. Temporal and distinct TGFbeta ligand requirements during mouse and avian endocardial cushion morphogenesis. Developmental Biology. 248, (1), 170-181 (2002). Krenning, G., Moonen, J. R., van Luyn, M. J., Harmsen, M. C. Vascular smooth muscle cells for use in vascular tissue engineering obtained by endothelial-to-mesenchymal transdifferentiation (EnMT) on collagen matrices. Biomaterials. 29, (27), 3703-3711 (2008). Medici, D., Potenta, S., Kalluri, R. Transforming growth factor-beta2 promotes Snail-mediated endothelial-mesenchymal transition through convergence of Smad-dependent and Smad-independent signalling. Biochemical Journal. 437, (3), 515-520 (2011). Krizbai, I. A., et al. Endothelial-mesenchymal transition of brain endothelial cells: possible role during metastatic extravasation. PLoS One. 10, (3), e0119655 (2015). Arciniegas, E., Sutton, A. B., Allen, T. D., Schor, A. M. Transforming growth factor beta 1 promotes the differentiation of endothelial cells into smooth muscle-like cells in vitro. Journal of Cell Science. 103, (Pt 2), 521-529 (1992). Deissler, H., Deissler, H., Lang, G. K., Lang, G. E. TGFbeta induces transdifferentiation of iBREC to alphaSMA-expressing cells. International Journal of Molecular Medicine. 18, (4), 577-582 (2006). Paranya, G., et al. Aortic valve endothelial cells undergo transforming growth factor-beta-mediated and non-transforming growth factor-beta-mediated transdifferentiation in vitro. American Journal of Pathology. 159, (4), 1335-1343 (2001). Maleszewska, M., et al. IL-1beta and TGFbeta2 synergistically induce endothelial to mesenchymal transition in an NFkappaB-dependent manner. Immunobiology. 218, (4), 443-454 (2013). Ubil, E., et al. Mesenchymal-endothelial transition contributes to cardiac neovascularization. Nature. 514, (7524), 585-590 (2014). Xu, X., et al. Epigenetic balance of aberrant Rasal1 promoter methylation and hydroxymethylation regulates cardiac fibrosis. Cardiovasc Research. 105, (3), 279-291 (2015). Xiao, L., et al. Tumor Endothelial Cells with Distinct Patterns of TGFbeta-Driven Endothelial-to-Mesenchymal Transition. Cancer Research. 75, (7), 1244-1254 (2015).